DURHAM, N.C.–(BUSINESS WIRE)–Tryton Medical, Inc., the leading developer of stents designed to treat coronary bifurcation lesions, today announced the U.S. Food and Drug Administration (FDA) has approved the company’s Premarket Approval (PMA) application for the Tryton Side Branch Stent for the treatment of coronary bifurcation lesions involving large side branches (appropriate for a ≥2.5mm stent). The Tryton Side Branch Stent is the first dedicated bifurcation device to receive regulatory approval in the U.S.
Coronary artery disease (CAD), the leading cause of death in the U.S. in both men and women, often results in the buildup of plaque at a site where one artery branches from another, also known as a bifurcation. Approximately 20-30% of all patients undergoing percutaneous coronary interventions (PCI) to open blocked arteries have a bifurcation lesion. Provisional stenting of the main branch is the current standard of care, but in many cases the side branch is not stented, leaving it vulnerable to complications like occlusion requiring bailout stenting. In a post hoc analysis of a randomized investigational device exemption (IDE) clinical trial, treatment with the Tryton Side Branch Stent in the intended population of patients with large side branches (appropriate for a ≥2.5mm stent) reduced the need for additional bailout stenting (0.7% vs. 5.6%, P = 0.02) and led to statistically significant lower side branch percent diameter stenosis at nine month follow up (30.4% vs. 40.6%, P = 0.004) when compared to provisional stenting. The post hoc analysis also showed comparable major adverse cardiovascular events (MACE) and myocardial infarction (MI) rates versus provisional stenting at three years. The safety profile of the Tryton Side Branch Stent was validated in a confirmatory study that compared patients treated with the Tryton stent to a performance goal based on performance of the control arm from the randomized IDE clinical trial. The confirmatory study met its pre-specified primary endpoint, periprocedural myocardial infarction (PPMI), which was within its non-inferiority margin (Primary Endpoint: 10.5% + 95% C.I. vs. 17.9%, p=0.01). Tryton has signed a strategic distribution agreement with Cardinal Health enabling Cordis, its interventional vascular business, to be the exclusive distributor of the Tryton Side Branch Stent in the U.S. “This strategic agreement is a significant step for Cordis to quickly get innovative technologies into the hands of our customers in the U.S. We are actively preparing to commercially launch this product with Tryton to ensure physicians will soon have a new treatment option in their cath labs to help deliver the best patient care available,” said David Wilson, President of Cordis. The Tryton Side Branch Stent is available in multiple device diameters (2.5mm to 3.5mm in the side branch) and is compatible with any conventional drug eluting stent in the main vessel. 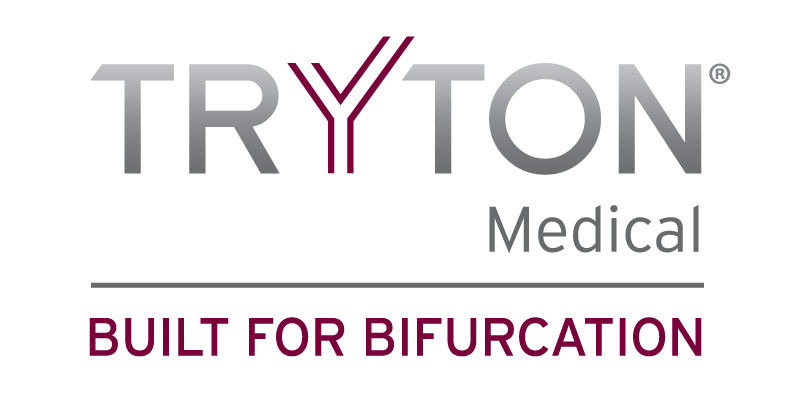 The Tryton Side Branch Stent System is built using proprietary Tri-ZONE® technology to offer a dedicated strategy for treating bifurcation lesions. Tryton’s cobalt chromium stent is deployed in the side branch artery using a standard single wire balloon-expandable stent delivery system. A conventional drug eluting stent is then placed in the main vessel. The Tryton Side Branch Stent has now been used to treat more than 12,000 patients worldwide. It is commercially available in multiple countries within Europe, the Middle East and Africa, and is now approved for use in the U.S.